I have attempted cake bites before after looking at Bakerellla's beautiful creations, but I failed miserably. I didn't even blog about it I got so mad at the darn things. WELL, then I found this idea for cupcake bites: http://www.bakerella.com/cupcake-bites-made-easy/. They looked easier and SO much cuter, so I decided to give it another try. This is the LOAD of leftover cake I had after trimming the wedding cakes. So first, crumble up your baked cake and add some frosting. I have read that one can of store bought frosting and one cake mix worth of cake is perfect. I just crumbled cake until I had a lot and added frosting until it was truffle like. This part is not hard, but the first time I did it I totally screwed it up. The cake was way too wet and it turned out terribly. You want to be able to make balls out of this that stay round and do not make your hands messy. Be careful and only add a little frosting at a time. I probably had 6 cups of crumbs and maybe 3/4 cup frosting. Those are ROUGH estimates, btw. Okay, roll the cake into little balls. Make sure they can sit inside a peanut butter cup mold. Stick these in the freezer for a few minutes while you melt chocolate. Melt some chocolate chips. Add a little veggie oil (like 1/2 a teaspoon) to make the chocolate easier to pop out of the mold. Melt this for only 30 seconds at a time in the microwave and stir between each time until fully melted. I only had it in the microwave for 1 minute total. You could also use candy melts or almond bark. Spoon chocolate into the mold until each one is about 1/3 of the way full. I got this mold at Fun Finity in Orem, UT but I think you can pick them up at the craft store too. Put a ball in each hole and push it down until the chocolate fills up the sides but does not spill out. Stick this all in the freezer for about 5 minutes before you pop them out. They popped out okay. I just turned the mold over and pushed real hard. If it is cold enough, they will come out so be patient. The oil helps too if you are using chocolate chips. These make the paper part of the "cupcake". SO CUTE!!! 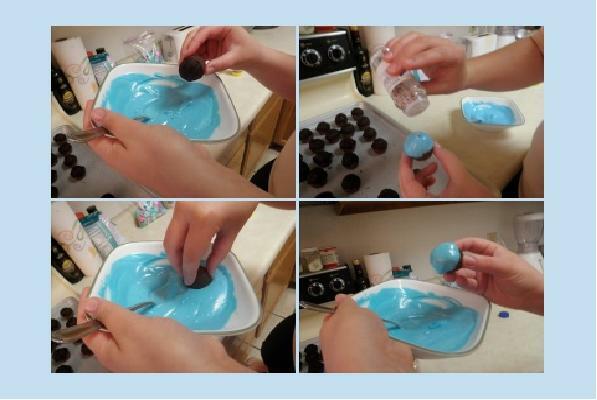 I used light blue candy melts for the tops or "frosting" part of the cupcake. I melted this per the directions on the back of the bag. 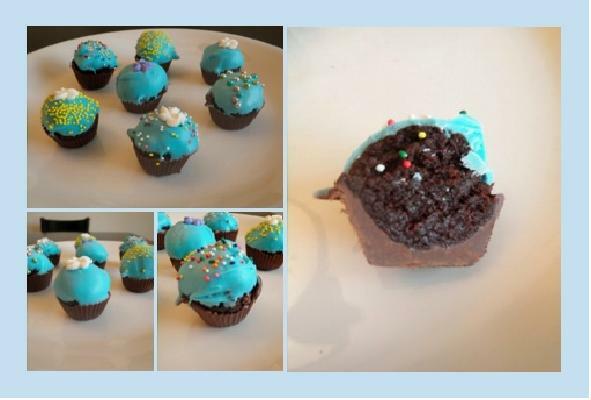 I dipped the cupcakes in the candy and moved it around until the blue met the chocolate. I put some sprinkles and old royal icing flowers on them while the candy was still wet. So, I think they turned out adorable. You could pop these back in the freezer or just wait for them to dry. Okay, so I love these! So much easier than cake bites or cake pops and even cuter! I can definitely see these at my next party. Can you tell I'm catching up on my Cake Optimist? These are the cutest cupcakes I have ever seen!